Articular cartilage covers the ends of the bones in your knee joint. Articular cartilage has a smooth, slippery surface that allows the bones to slide over each other without rubbing. Lesions can appear in the surface, damaging the articular cartilage. A grade IV, or full-thickness, lesion is a tear that goes all the way through the cartilage. 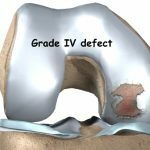 Grade IV lesions usually require surgical repair. You may have injured your articular cartilage and not even know it. This is because a lesion is not usually painful at first. There are no nerves in cartilage tissue, but any lesions can cause the knee joint to become inflamed and painful. If the lesion is large enough, the bone below the cartilage will be exposed. Pressure and strain on this unprotected portion of bone can also cause pain. If the cartilage injury isn’t treated, it may cause other problems in the knee joint. Unlike other parts of the body, cartilage cannot heal itself from injury, because it lacks a nourishing supply of blood vessels. A full-thickness lesion, however, may begin to heal from the blood supply inside the bone. Your body will form a scar in the area using a special type of cartilage called fibrocartilage. Fibrocartilage is a dense, tough, fibrous material that helps fill in the lesion. However, it lacks the smooth, glassy surface of the articular cartilage that normally covers the surface of the knee joint. Whether you need surgery to repair a full-thickness lesion is a decision to make in consultation with the advice of your orthopedic surgeon. Your surgeon may begin you on a course of pain management. That includes applying ice and heat, taking prescription medications, and/or working with a physical therapist. Your orthopedic surgeon may recommend a knee brace or shoe orthotic to improve knee alignment in order to ease pressure on the sore knee. Your age and lifestyle, the overall condition of your knee, and how bad the lesion actually is are also factors your orthopedic surgeon will take into consideration before recommending knee surgery.